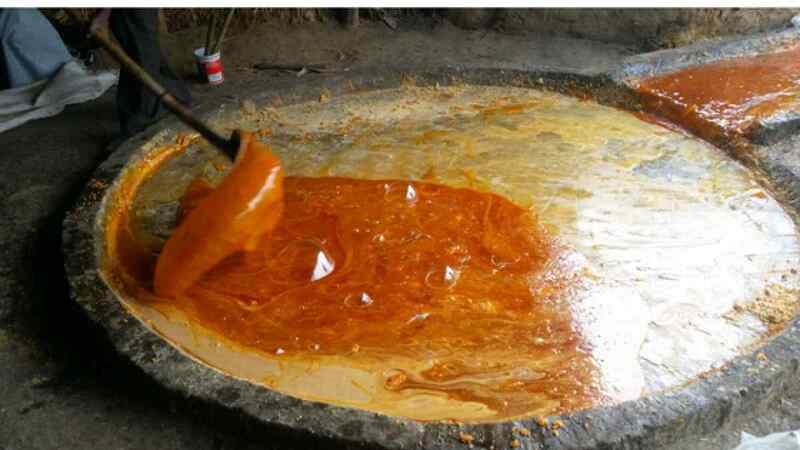 Jaggery is known by many names like gud, bellam, vellum, sharkara, bella or gul. Just like it has many different names, it also holds numerous amazing health beneficial and medicinal properties. Do not be surprised if your doctor prescribes you to have jaggery instead of sugar. You might be wondering, what difference does it make, both jaggery and sugar are sweet. If sugar might be harmful, so may jaggery be. But contrary to this, the more sugar is harmful, the more jaggery is beneficial. A portion of jaggery mixed with some spices like fennel seeds, loads of dry fruits and dry coconut, in no time you can have your homemade bite chocolate, which is not even harmful. 1. Strengthens Bones: having jaggery will strengthen your bones. It will not only prevent joint pains but will also keep you away from bone problems like arthritis. Mix grated jaggery in your glass of milk daily and see the magic. Not much of a milk drinker, you can also try it in your tea. It is easy to make Gud ki chai, place water for boiling, add jaggery to it with some ginger and cardamom powder. After the jaggery gets dissolved, add tea leaves, let it boil, then add milk. Boil it for 2 minutes and switch off the ignition. Your tea is ready. 2. Helps you lose weight: if not anything else, surely this reason will motivate you to try jaggery. Everyone wants to fit into that one dream dress of theirs and jaggery might just help you. jaggery is rich in potassium and this helps to improve the metabolism of your body. Along with balancing the electrolytes in the body, potassium also helps in balancing the muscles. Another plus point of high potassium in jaggery is it helps in reducing water retention. SO, go for it, try jaggery to get that perfect shape. 3. Purifies blood and prevents disorders: jaggery not only purifies our blood but also increases your level of haemoglobin. The reason behind this is its richness in iron and fotate. This prevents you from getting anaemic and maintains a normal level of red blood cells. Another way that helps you keep away from falling sick is, jaggery flushes out all toxins from the liver, which keeps you fit. If you have trouble during your periods and often complain of having cramps during those days, try some jaggery. 4. Builds up the energy level: try switching to jaggery, instead of caffeine to boost your energy level. Unlike sugar, jaggery gets absorbed into the bloodstream slowly and keeps your energy level for a longer time compared to sugar or caffeine. 5. Your sweet guide during pregnancy: carrying a baby can also make you a baby yourself, craving for the oddest things at the oddest hours. Jaggery can be your rescuer if suddenly in the middle of the night you crave to eat something sweet. But make sure, it is not consumed much during the early months. Having Gud during pregnancy also prevents you from becoming an anaemic or iron deficit. Also, according to the Ayurveda, jaggery is recommended to pregnant women, as it provides instant energy, that too for a longer time. 6. Magic for your skin: rich in numerous minerals and vitamins, jaggery not only keeps your body healthy but is also a boon for your skin. If you are looking for a glowing and healthy skin without using any chemical cosmetics for it, just a bite of jaggery every day is your prescription. Other advantages of having jaggery are, it keeps your face pimple free, reduces wrinkles, and lightens dark spots too. 7. Home remedy for a sore throat and cold: be it running nose, cough or an unbearable headache, jaggery is the all-in-one cure. The vitamins and minerals that it is enriched with have qualities to sooth you inflamed throat instantly. Have you heard your grandmothers and mothers saying to have Kada, during cold and cough? Well, jaggery is one of the main ingredients of that sour kada. Even if you are suffering from joint pains, mix grated jaggery with fresh ginger and have it daily, you will feel the change. Though it has many medicinal values and keeps you healthy, but like it is said excess of anything can be harmful. Due to its richness in calories, it is recommended to consume jaggery in moderation. Also, make sure to consult your doctor before having jaggery if you are diabetic. If you are thinking of having it for weight loss, keep a check on it as much jaggery may also do the opposite. You might gain weight and experience fluctuation in blood dugar levels if consummed excessively.